Dead To Me by Cath Staincliffe, a Mysterious Review. 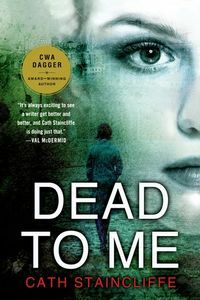 Review: DCI Gill Murray, head of Manchester's Murder Investigation Team, assigns new recruit Rachel Bailey to partner with her friend Detective Constable Janet Scott in Dead To Me, a stand-alone mystery that serves as a prequel to the ITV television series Scott & Bailey. The partnership does not seem like an ideal match on paper. Scott is middle-aged, intelligent, perceptive, and reliable, happy with her current position, applying methodical approach to solving crimes. Bailey is younger, impetuous and ambitious, often acting before thinking through the consequences. Still, Murray believes that their individual strengths will play out successfully as partners in the field. Their first major case together is the murder of Lisa Finn, a 17-year-old drug addict, who may have been raped before she was killed. Dead To Me is as much about the principal three female characters as it is as about the murder investigation. Indeed, the characters are so well-developed and so appealing that they make the case on which they are working all the more interesting. Murray is a single mom raising a teenaged son, and dating a London lawyer. Scott is recently separated from her husband, trying to raise her two sons while working as a police officer. Bailey married her high school sweetheart, who stays home raising their daughters while she pursues a career with Manchester's MIT. The dynamics of the precinct are exceptionally well balanced with the officers' personal lives, drawing readers into this arresting story that grabs one's attention on page one and doesn't let up until the very end. Special thanks to guest reviewer Betty of The Betz Review for contributing her review of Dead To Me. Acknowledgment: Minotaur Books provided a copy of Dead To Me for this review.